"Well that was a disaster of a night Alfred. Those girls just didn't shut up." "Alfred. I think the Riddler's anagram has something to do with Catwoman.....A bad felines lion puts out"
Yes, Batman often comes to where I live. And that's when his Dark Knight began to rise. While he’d been away Alfred had been using the Wayne Mansion as a House of ill repute. I wish they would slow down robing, i am not getting any younger. "When I said let's look for Cockrobin, I was talking about the English nursery rhyme." "I've got a good wingman"
All the superheros go weak at the knees, when DC the girls on offer. "Ears looking at you, kid." 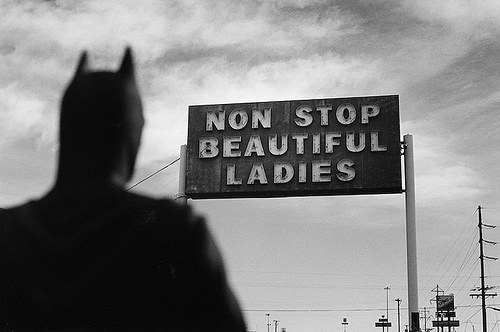 Batman can't resist the go-go girls. When the Bat-Signal broke down Commissioner Gordon had to resort to an alternative. "True, they just pass me by without stopping. Drives me bats." The Poker, The Fiddler, and Mr. Cheese. Batman knew he'd find all three at Pussywoman's place.